This helps kids view maze puzzles in a new way. With Puzzle Play Software Mazes, kids get a workbook of 57 colorful mazes and a CD-ROM. 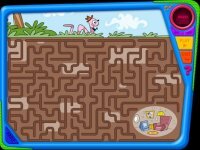 The software provides 30 diverse backgrounds on which to construct your own maze puzzle, including a monkey eyeing a banana up in a tree or the shape of a star. You design the path of your maze from a "Start" point to the "Finish." You can do this by using the arrow keys or the mouse. When you have finished the maze path, the computer fills in the rest of the maze with misleading and dead-end pathways. After you have made the maze you can then play it – race against the clock, or against a little computer character (think "Pac-Man"). You can have friends or family members play it either on the computer or away from it once it has been printed. Unfortunately, none of the puzzles in the series can be saved.